Our Low Carbon emitting applications made out of gabions were chosen by Atlantech for their low carbon footprint properties in a project in Lagord (France). The Urban Community of La Rochelle took the opportunity of the handover of a military site in the municipality of Lagord, bordering La Rochelle, to develop an ambitious urban project—a large area of ​​economic development, specialized in showcasing energy transitions into urban areas, buildings, and renovations. As part of a “Technopolitan” approach, Atlantech plans to help stimulate the development of technological activities and services in the fields of energy eco-efficiency in urban areas and the rehabilitation of building while adhering to environmental standards. On 27 acres of former military wasteland, this groundbreaking final showcase for sustainable development is expected to accommodate more than 500 homes, an apprentice training center, and an important tertiary center. In doing so Atlantech hopes to both produce an economic model for the construction and renovation of the future and foster interdisciplinary exchanges. Urban planning rules have been defined to reduce the carbon footprint of all structures, buildings, and roads. 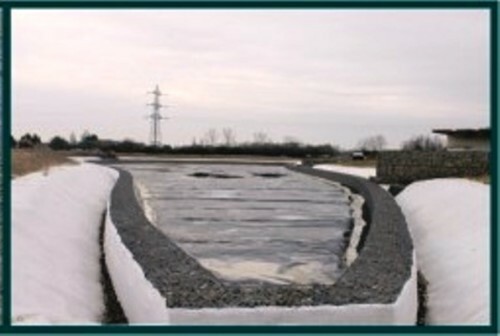 The Urban Community of La Rochelle and the Lollier design office of Engineering and Landscape Architecture chose Maccaferri’s solutions based on their low carbon footprint, accordingly with environmental guidelines recently defined within COP21. In order to qualify, each contributor must also complete an array of “energy consumption and emission of greenhouse gases” tests in order to calculate the volume of CO2 emissions in tones. For further information, do not hesitate to contact our experts.